A simple method to root I9505XXUGNG8 Android 4.4.2 KitKat Firmware is now available at NasirTech. Samsung Galaxy S4 GT-I9505 recently get updated to the official I9505XXUGNG8 4.4.2 KitKat Firmware. If you yet to update the firmware, then update the same by following this link- I9505XXUGNG8 Android 4.4.2 KitKat Firmware for Galaxy S4 GT-I9505- How to Install. If you already get the update and looking for a working method to root the firmware, then you can now root the same using our simple tutorial below. The below guide will help you to root XXUGNG8 4.4.2 KitKat Firmware running on Galaxy S4 GT-I9505. Continue reading the tutorial for the complete step by step guide. After updating official firmware, your device no longer belongs to rooted device. So, after official firmware update, many of us prefer to root our device to enjoy some additional features that unrooted android device doesn't offer. With a rooted android device, you can install apps that ask root permission, flash various custom ROMs, install MODs and tweak various features. Root removes default bloatware apps that free-up lots of memory space and extend the battery life. However, once rooted, manufacturer warranty will be void. But you can regain the warranty by following proper unroot process. To know more about benefits of rooting android device, read- Complete Note on What is Rooting and Benefits of Rooting Android Phone. So, want to root Galaxy S4 GT-I9505 Running I9505XXUGNG8 4.4.2 KitKat Firmware? Continue reading this page to get all the necessary steps to successfully root your device. The root file (CF-Auto-Root) we used in this tutorial is safe and have nearly 100% success rate. We'll use Odin software to flash the root file. The tutorial is made with simple step by step guide, so that even an android newbie user can follow and successfully root his/her device. However, in this process you may loss your personal data and settings. So, we recommend you to follow all the backup instructions before proceed to rooting guide. This rooting tutorial is only applicable for Samsung Galaxy S4 GT-I9505 model (jalte). So, don't try this in any other android device. Check your device model number from- Settings-About Phone. Rooting voids your phone's manufacturer warranty. However, you can get back the warranty anytime by following proper unroot process or by flashing official firmware. This guide is for educational purpose and you should try this at your own risk. We are not responsible if your device experience a soft brick after following this tutorial. Check battery percentage, charge your device to a decent level of at least 60% battery power. Your device should not turn off during installation. All the above pre-requisites are very important and must be followed before proceed to installation guide. Hope you get all the above points and done as mentioned. Now, you are ready to move to the final step of this tutorial where we have arranged a step by step details guide to root Galaxy S4 GT-I9505 running I9505XXUGNG8 4.4.2 KitKat firmware. Now, Switch off your phone and boot Galaxy S4 I9505 into Download Mode by pressing and holding the Volume Down+Home+Power buttons together (long press until the boot screen appear), now press Volume Up key to proceed to Download Mode. In Odin3 screen, you should see a COM Port number like “0:[COM7]” at ID:COM section and “Added!” text at the message box. This means your device has been detected by Odin3. Make sure that, only the “Auto Reboot” and “F. Reset Time” options are checked. Now, click on the AP (PDA in older Odin) button and select the CF-Auto-Root-jflte-jfltexx-gti9505.zip.tar.md5 file. Finally, click on the Start button to begin the rooting process, wait few moments. Congrats! You have completed the tutorial to root Galaxy S4 I9505 running I9505XXUGNG8 4.4.2 KitKat Firmware. Hope you successfully done the rooting process. 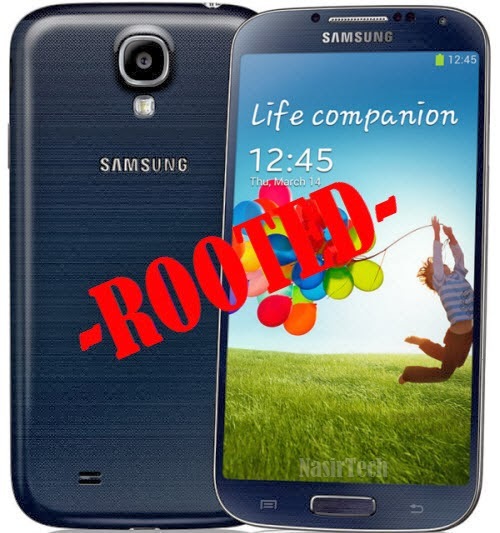 If you followed everything as mentioned in the above tutorial, then your Galaxy S4 I9505 should now rooted and you have complete control over your device. Now, install apps that ask root permission or flash various custom ROMs. To verify your device is rooted or not, you can download and run the Root Checker App from Google Play Store. If you have any doubt or query about the tutorial, feel free to contact with us using the comment form below, and share your rooting experience with us. But when i boot in recovery you can see at the top it says XXUGNA8??? And the Android Icon had a red triangle in his belly. Ken you tell me if I’am right or wrong? I also try to root as per your directions but unfortunately " FAIL"
There is no PIT partition. Hmm, apparently Mr Mohammad Nasir doesn't reply to questions, I suppose this is a fake.